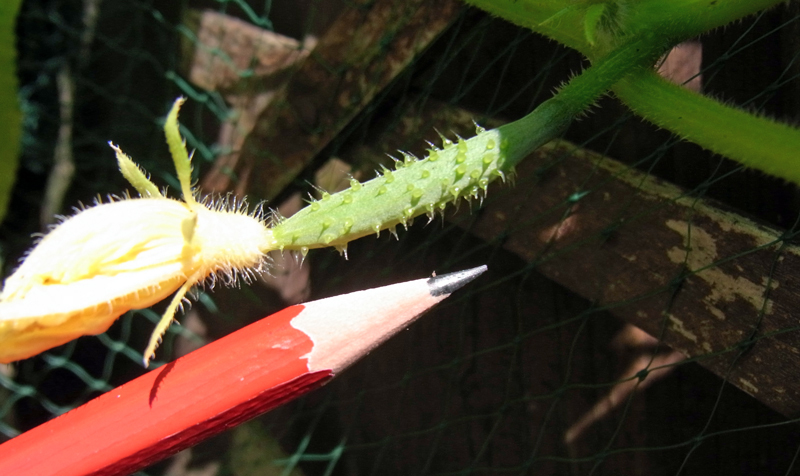 There’s something cute about tiny cucumbers just starting to form. All of a sudden the first few have appeared this week and I took the opportunity to pinch out the growing tip of each plant so that they concentrate on putting out the fruit-bearing side shoots. They have a trellis and netting to climb up. Some say to let outdoor cukes trail across the ground but to me that would make watering tricky as well as equating to hand delivering a VIP dinner invitation to passing slugs. Having said that, the beds are currently full of wonderful anti-slug nematodes, which I applied a week ago. Not just the slug busting variety but also the fruit and veg protection variety, which is supposed to tackle ants, carrot fly and similar. A watering bar is good for nematodes but be sure that the sprinkler holes are big enough to let the mix through. I must say there doesn’t seem to be much pest damage at the moment, but it’s important to keep the treated areas well watered for a fortnight or else the nematodes turn into deadatodes, which is a shame as they’re not cheap. 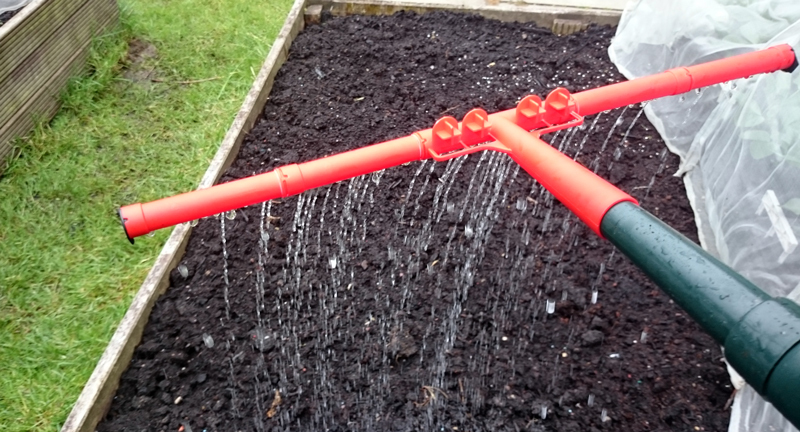 Keeping everywhere wet means watering twice a day in this scorching weather. It was so hot today I waited until 4:00pm to start the day’s gardening. Duties included thinning out the carrot seedlings. 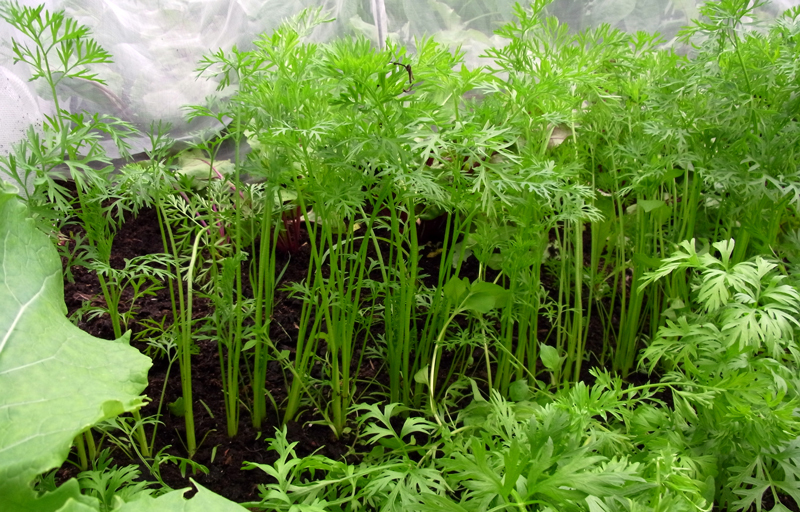 It doesn’t quite feel right to call them seedlings as they’re about a foot high now but as the spare ones were coming out of the ground it was clear that they’re still very immature with the carrots only just forming below ground. Of course they’re straight back under a mesh tunnel now, to keep carrot flies away. Nearby, the trial French bean variety Satelit hasn’t wowed with its performance so far. Some didn’t germinate and those that have are lagging some way behind the borlotti bean plants that they share a bed with. Noticing that difference a couple of weeks ago I sowed some extra borlotti in a tray and today planted those out in the gaps. Likewise some replacement mangetout went in the ground today, filling in a few gaps. 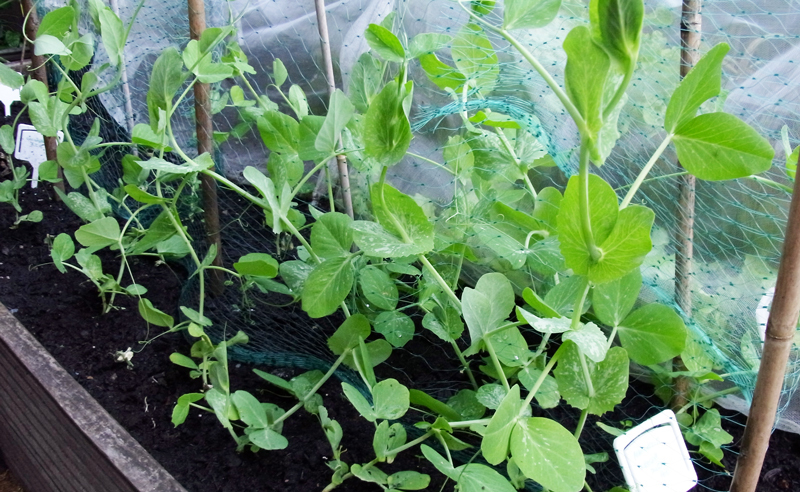 And as they’re now starting to grow and send out tendrils to support their new height, I fixed up some netting for the mangetout to latch onto and climb up. The broad beans are now flowering and the bees are having a field day with them. There’s been no black fly invasion yet, nor any ants hanging around to farm them. But if black flies start to appear I’ll whip the top off each plant and apply some treatments to shoo them off. I don’t want to take the tops off yet though as the plants are still growing and producing new flower buds near the top. 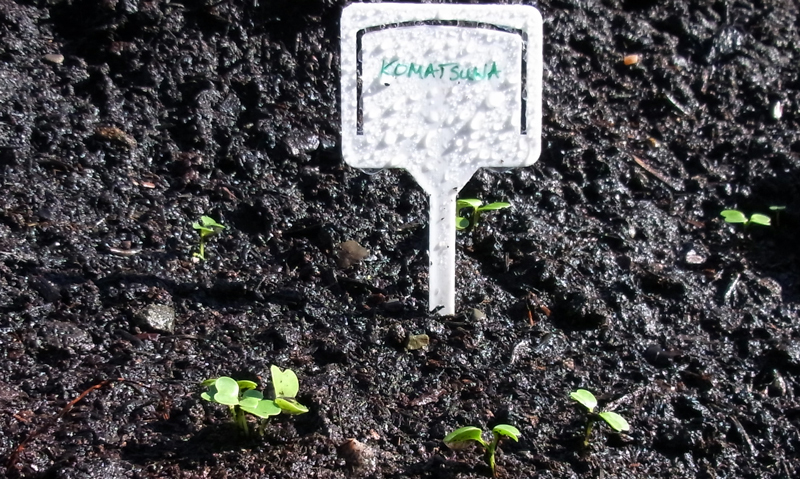 In the same bed I’ve sown a long row of perpetual spinach beet and a small square of komatsuna: Japanese mustard spinach. They’re just tiny green seedlings for now but should end up dark and lush spicy leaves in a few months. 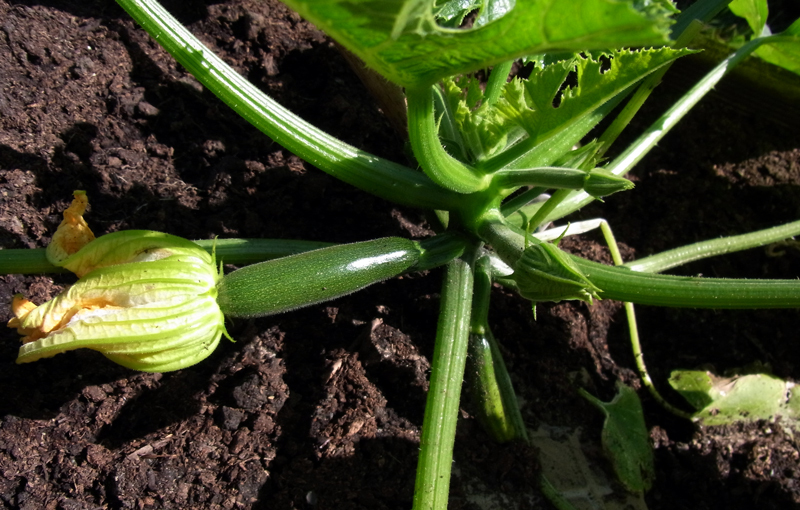 Just a few feet away the courgette plants are starting to fruit. I’ve two varieties on the go: Tuscany (pictured), which makes smooth, handsome courgettes with a mellow, refined tast and Romanesco which is recognised by its ridged shape. I look forward to lots of both, with spiralizer at the ready. The day ended with potting on all the tomato plants into bigger containers so that they can stretch their legs. 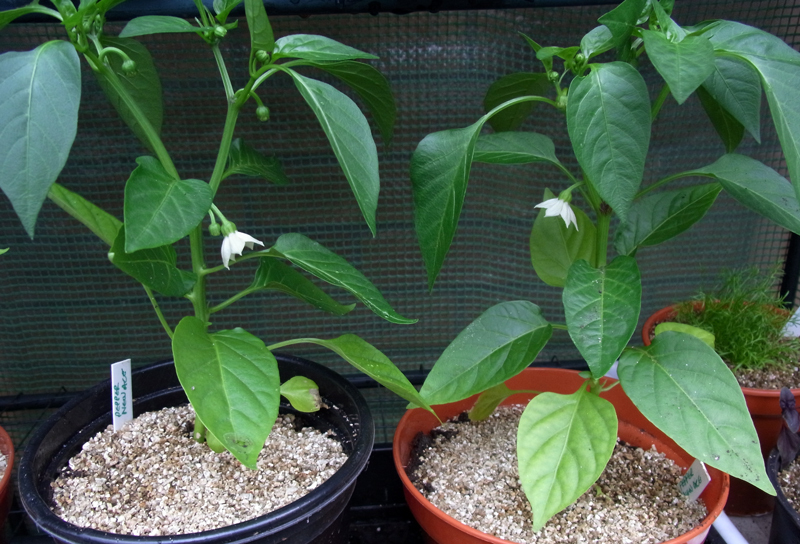 Some are showing their first flowers, just like their roommates in the mini greenhouses – the sweet pepper plants. 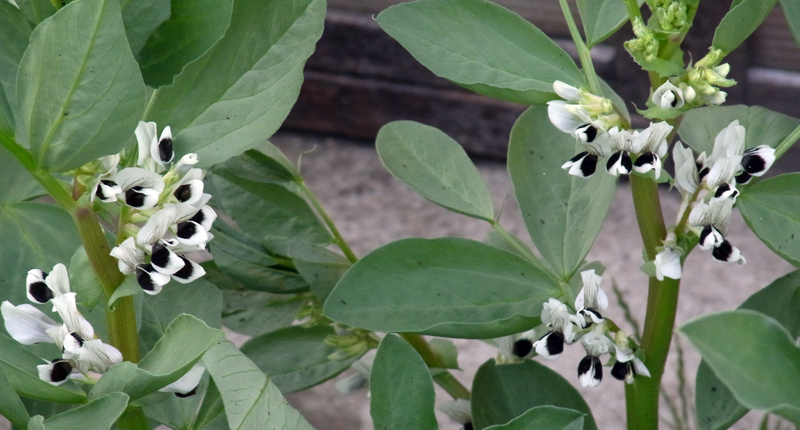 The New Ace variety look to have great potential, with lots of flower buds promising more than a peck of peppers, some perhaps even pickled. Does anyone know someone called Peter Piper, who’d like to pick them?